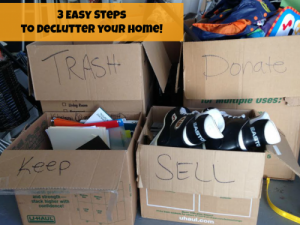 3 Easy Steps to Declutter Your Home! Frequently the new year can bring about the urge to get your life in order. It’s a clean slate and you often want to start off with a clean house! That means getting rid of all that clutter! It can be very appealing to imagine of a life without all that mess dragging you down. Less to clean, organize, less stress and that adds up to more energy to put towards the fun things in life! This can be a very overwhelming process and as you start to search for a place for the things that are lying about you begin to realize they are there for a reason. There’s no place to put it all! Your closets may be filled to overflowing so then you start to reorganize. Don’t stop here. This is what scares most people off, but you can do this! Just follow these 3 easy steps. The first thing you should do is gather 5 boxes. One box should be labeled “Keep,” another “Sell,” a third “Donate,” and a fourth “Trash.” As you start to pull out items they should fit into one of these boxes. And that fifth box? That’s for all your photos, slides, VHS movies, and film reels. It’s that simple! You will be surprised with how quickly those “sell” and “donate” boxes will fill up! Once you are finished sorting, drop off all your items for donation and either take your “sell” items to a consignment store or move the box to the garage for the next yard sale. Now you are only left with box number four which is full of memories. Did you know that as many as 40 of the small film reels (50 feet of film, reel size approximately 3″ across) can fit onto just one DVD? And at least 3,000 slides or 5,000 photos can also be scanned to fit on a single DVD. 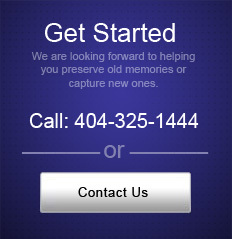 Not only should you be transferring these memories to digital to preserve them, but it will free up so much more space! If you are interested in transferring your slides to DVD we can also lend you a slide sorter which allows you to easily view and organize your slides.